I posted recently on the importance of whale falls to deep sea environments. Wouldn't you know it (there's a pun in there, look for it...), but tree falls have recently been discovered to serve a similar function. 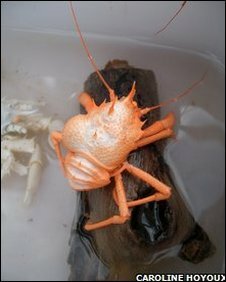 These two crustaceans (a galatheid crab to the left and a squat lobster below) are but two species of deep-sea dwellers who specialize in eating trees. When a tree falls (screaming?) into the ocean and is carried out to sink into the deep sea, it turns out that there are many specialized creatures ready to dine. Researchers, who have always had a tough time being able to properly investigate these deep environs, came up with a very clever means of discovering exactly what eats these tree falls. They created a trap with wood bait that had holes just large enough to let larval mollusks and crustaceans in, but small enough to keep then in once they had matured. Then, voila, after a year they lifted the trap to the surface and took a look inside. Pretty ingenious, eh? If aliens ever wanted to pull off a similar experiment here, they could lower a pizza-filled trap in my back yard. Then within only a few weeks I'd be too large to escape... I hope aliens don't read blogs. Thanks for the link, Andrew.